My brother - Karthik.S met with head injury. 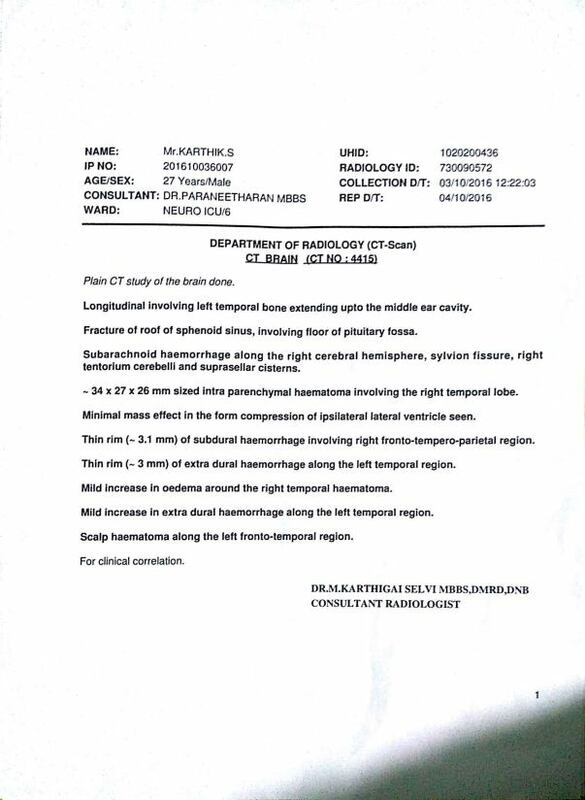 He was diagnosed with fracture and severe clots in the brain.He is being treated at the Global hospitals, Perumbakkam, Chennai. So far two surgeries have been performed - Craniectomy and Craniotomy for brain and a thoracic surgery for lungs as well. Another surgery is scheduled for 8th of November 2016. His medical expenses as of today (7th November)is 23 lakhs, out of which we have managed to pay around 13 lakhs . The Total estimated cost for the treatment till this month (November)end will be approx. 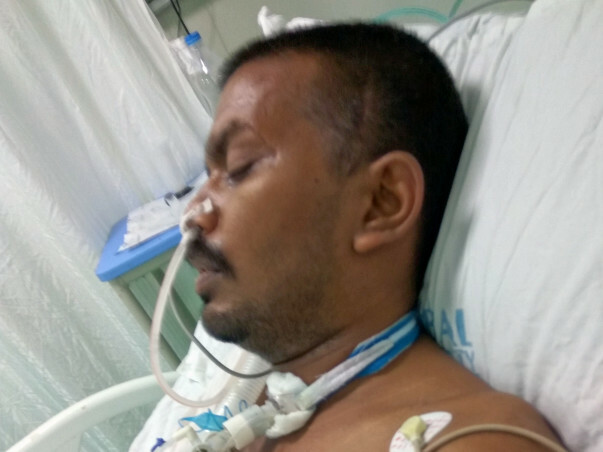 30 Lakhs including the brain surgery and other medical expenses. My brother is supporting our family and this trauma has financially crippled us. 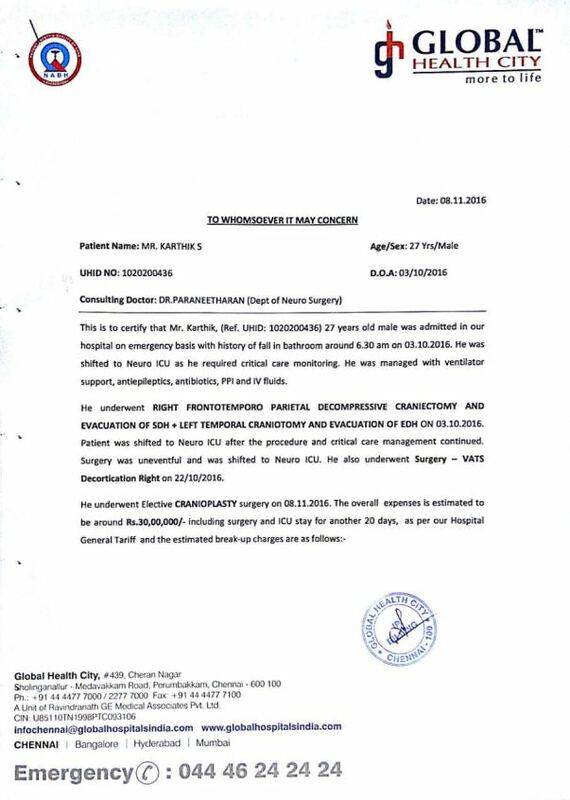 We don't have any other source to manage his medical expenses.I humbly request you to help us financially to pay his operation and ICU fees of 20 Lakhs. 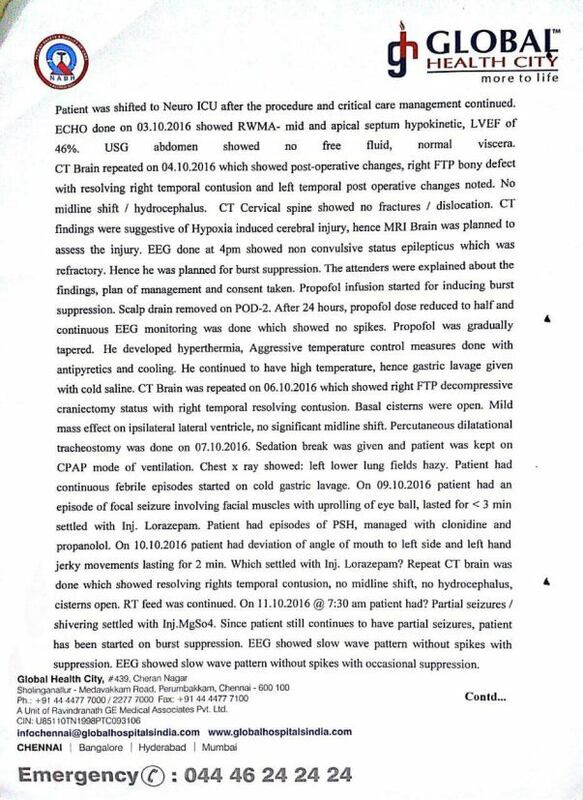 I have attached his scan report, treatment summary. Our family is grateful for all the funds and prayers we are receiving and It is healing my brother everyday. I would like to thank all of your for your support. 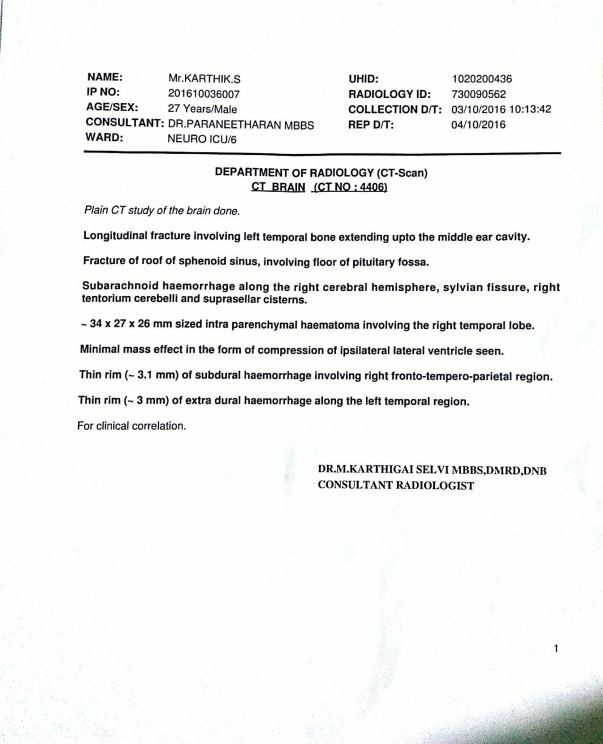 Here is an update regarding Karthik’s health. 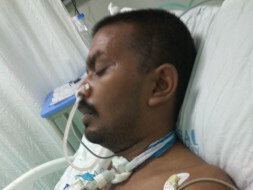 Following the last update, Karthik is not in the hospital anymore and is shifted back to his house. He has his physiotherapy sessions going on, twice a day. He has a nurse by his side 24*7, who takes care of his oil massages and other health aspects. 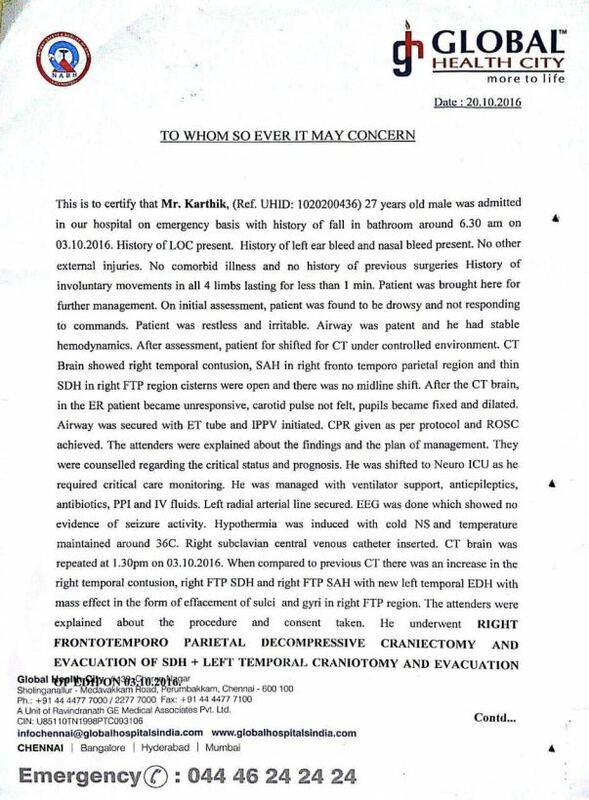 Karthik is bedridden for the past 6 months. He is in semi-conscious condition where is eye balls move when he wants to react to something. He is able to cough also. His sister, Archana, says that they have noticed improvement in this health ever since he has been shifted to home. He as started swallowing food through his mouth at a minimal quantity of 20-30ml per day. 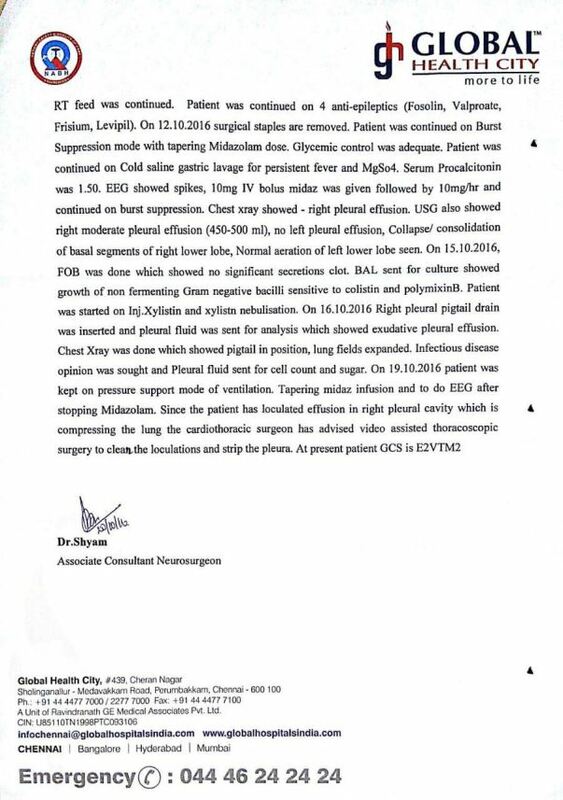 She also states that his body temperature was extremely unstable in the hospital and ever since he has moved into the house, it has become stable. Even the doctors are of the view that he is improving neurologically. However, it will take time for him to regain his consciousness completely. We thank all of you for your wonderful support. Crainioplasty surgery was successful and my brother is opening eyes now. He is still not 100% conscious,but sometimes he is able to hear us and respond by moving his hands and legs slightly. Doctors have advised us to take him home. All he needs is physiotherapy and bedside nursing care until he recovers. I would like to thank you all for supporting our family in this difficult time. This time help and prayers is helping our family stay strong. Thank you from the bottom of my heart for all your help! My heartfelt thanks to everyone for your generosity. My brother is off the ventilator now and he is recovering slowly. Cranioplasty surgery is scheduled next week and this will improve his condition further. I'm sure your help and prayers are healing my brother every day. I thank you very much for your support at this challenging time.